THE WEATHER IS set to take a turn this week with heavy rain, severe frost and snow forecast for the week ahead. Outbreaks of rain this morning will turn widespread by the afternoon. 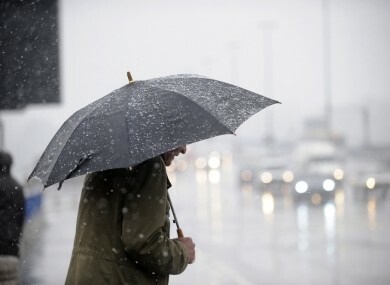 Met Éireann says the rain will become heavy, with some hail and thunder. Frost is expected to settle in early tonight with isolated showers turning wintry and a possibility of snow. Temperatures are set to dip to -1 degrees. Tomorrow will be a cold day with highs of just 7 degrees. While many places will start dry with some sunshine, wintry showers with snow are forecast as a possibility for western areas. Showers will then spread across the country but the strong winds will gradually ease. Tuesday night will be very cold with a severe frost and lowest temperatures of -4 degrees. Wednesday and Thursday will stay cold with frost again on both nights. Overall it’s looking cold for most of the week, turning milder by the weekend. Email “Cold week ahead with severe frost, snow and lows of -4 degrees ”. Feedback on “Cold week ahead with severe frost, snow and lows of -4 degrees ”.